Herbs: (Echinacea; Goldenseal; Lemon Balm); Aromas: (Eucalyptus; Tea Tree & Thyme; Dead Sea Minerals: (Magnesium Chloride (MgCL); Potassium Chloride (KCL); Sodium Chloride (NaCL); Calcium Chloride (CaCL); Bromides (As Br); Insolubles. Masada Dead Sea Mineral Salts, Specific Natural Herbs known for healing and essential aromatic essences give you triple the treatment for whatever ails you. 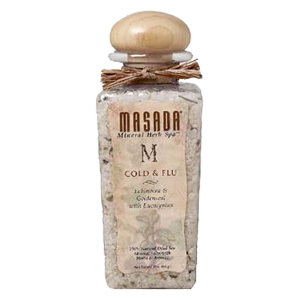 Cold & Flu Mineral Herb Spa - is shipped in a discrete, unmarked package. Orders are processed immediately and usually take about 3 to 5 working days to be received. We do ask that you try it for 2 to 3 weeks to feel the full effects. Any information received is used only for order processing and shipping purposes. Your information, such as e-mail address, will never be disclosed to a third party.